The economic collapse of Japan has begun. The extent of the devastation is now becoming clear and many are now projecting that this will be the most expensive natural disaster in modern human history. The tsunami that struck Japan on March 11th swept up to 6 miles inland, destroying virtually everything in the way. Countless thousands were killed and entire communities were totally wiped out. So how does a nation that is already drowning in debt replace dozens of cities and towns that have suddenly been destroyed? Many in the mainstream media are claiming that the economy of Japan will bounce right back from this, but they are wrong. The tsunami decimated thousands of square miles. The loss of homes, cars, businesses and personal wealth is almost unimaginable. It is going to take many years to rebuild the roads, bridges, rail systems, ports, power lines and water systems that were lost. There are going to be a significant number of Japanese insurance companies and financial institutions that are going to be totally wiped out as a result of this great tragedy. Of course in the days ahead the Japanese people will band together and work hard to rebuild the nation, but the truth is that it is impossible to “bounce right back” from such a massive loss of wealth, assets and infrastructure. Just think about what happened after Hurricane Katrina. Did the economy of New Orleans bounce right back? No, there are some areas of New Orleans today that still look like war zones. Well, this disaster is much worse. The truth is that this is going to be one of the defining moments in the history of Japan. Hundreds of miles along the coast of Japan have been absolutely devastated. Authorities are finding it difficult to even get food and water into some areas at this point. Even before this great tragedy Japan was one of the nations that was on the verge of a national economic collapse. Their economy had been in the doldrums for over a decade and their national debt was well over 200 percent of GDP. Now the Japanese economy has experienced a shock from which it may never truly recover. The Bank of Japan is already flooding the Japanese economy with new yen, and so we may indeed see some impressive “economic growth” statistics at the end of the year. But just because lots more yen are being passed around does not mean that the Japanese economy is in better shape. The truth is that a tsunami of yen is not going to undo the damage that the tsunami of water did. A massive amount of Japanese wealth was wiped out by this disaster. An economy that was already teetering on the brink is now very likely going to plunge into oblivion. It is fine to be optimistic, but the cold, hard reality of the situation is that this is a knockout blow for the Japanese economy. The extent of the devastation is just too great. This truly is a complete and total nightmare. The following are 14 reasons why the economic collapse of Japan has now begun…. #1 The Bank of Japan has announced that they have decided to flood the Japanese economy with 15 trillion yen. That is the equivalent of roughly $183 billion dollars. This is going to provide needed liquidity in the short-term, but it is also going to set Japan on a highly inflationary course. #2 Japan’s Nikkei 225 stock average declined by more than 6 percent on Monday. As the full extent of the damage becomes apparent more declines are likely. 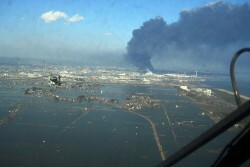 #3 Oil refineries all over Japan have been severely damaged or destroyed. For example, six refineries that combine to process 31 percent of the oil for Japan have been totally shut down at least for now. #4 The damage to roads, bridges, ports and rail systems is estimated to be in the billions of dollars. The damage done to power lines and water systems is almost unimaginable. It is going to take many years to rebuild the infrastructure of Japan. #5 Right now the flow of goods and services in many areas of northern Japan has been reduced to a crawl, and this is likely to remain the case for quite some time. #6 Many cities and towns along the east coast of Japan have essentially been completely destroyed. #7 Japan’s nuclear industry is essentially dead in the water at this point. Even if there is not a full-blown nuclear meltdown, the events that have transpired already have frightened people enough to cause a massive public outcry against nuclear power in Japan. #8 Japan is going to need even more oil and natural gas in the long run to replace lost nuclear energy production. Prior to this crisis, Japan derived 29 percent of its electricity from nuclear power. #9 Japan is the second largest foreign holder of U.S. government debt, but that is about to change. Japan currently has about $882 billion in U.S. Treasury bonds and they are going to have to liquidate much of that in order to fund the rebuilding of their nation. #10 Many factories in Japan are closing down at least temporarily. For example, Nissan has shut down four factories and Sony has shut down six factories. #11 Toyota has shut down all production at its factories in Japan until at least March 16th. #12 A substantial number of Japanese financial institutions and insurance companies are absolutely going to be devastated by this nightmare. #13 Japan’s budget deficit was already 9 percent of GDP even before this tragedy. Now they are going to have to borrow lots more money to fund the rebuilding effort. #14 Japan’s national debt was already well over 200 percent of GDP even before this tragedy. How much farther into the danger zone can they possibly go? Sadly, as the economy of Japan goes down it is going to have a huge affect on the rest of the world as well. For example, Japan is no longer going to be able to buy up huge amounts of U.S. Treasuries. So who is going to pick up the slack? Will our government officials beg China to lend us even more money? Will the Federal Reserve just “buy” even more of our government debt? Right now there are more questions than there are answers, but what is clear is that the Japanese economy has just been dealt an incapacitating blow. Hopefully this tragedy will bring out the best in the Japanese people, but no matter how resilient they are, the truth is that this is something that no nation would be able to bounce back from quickly. Let us hope that the economic damage from this tragedy will be contained and will not spread to the rest of the world. The global economy is already in enough trouble, and hopefully this tragedy will not cause a cascade of economic failures to sweep the globe. Has The Tsunami In Japan Destroyed The Japanese Economy?